Last night’s UFC 113 would have to be one of the better UFC fight nights for your Pay Per View money that have happened in quite a long time. I’ve already written and posted full videos of the video where Shogun Knocks Out Machida and then also the Kimbo Slice vs Matt Mitrione (Fight Video). Next up is the incident that took place during the Josh Koscheck (WW # 4) vs. England Paul Daley (WW # 8) fight. You see, Josh Koscheck beat Paul Daley fair and square during the fight, but after the fight was called by the ref, Paul Daley decided to step up and take a cheap shot at Josh Koscheck. The cheap shot was rather cheap since the fight had already been called in favor of Josh Koscheck, and Koscheck wasn’t even looking when Paul Daley took the cheap shot. Now there aren’t a whole lot of videos on the web showing the Paul Daley cheap shot but there was a half way decent one of the cheap shot I was able to find. So here’s Paul Daley taking a cheap shot at Josh Koscheck after getting beat by Koscheck in UFC 113. 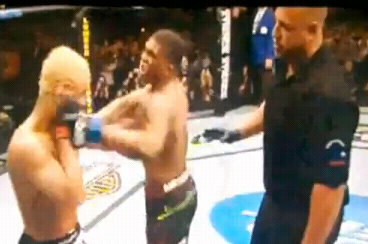 So what do you think about this cheap shot by Paul Daley on Josh Koscheck? And I have no idea about this – but what are the penalties or fines that are associated with actions like this? they shouldnt kick him out.hes a thug.everybody knew that.fine him and give him a second and final chance.